This review was originally written for the Baker Street Babes, and I’m sharing it here. It can also be found here on the BSB website. One year from “The Abominable Bride.” Nearly three from the last regular-season-order episode “His Last Vow.” The combination of seemingly-interminable hiatus, international build, and a fandom given to painstaking analysis means that “The Six Thatchers” came onto screens less like a single episode of a mystery series and more like the receptacle of the collective weight of metric tons of expectations. The answer is a complicated yes and no and maybe. I’ll delve into all three, in an effort to make a complicated episode (and the complicated opinions of members of our podcast) into something coherent. When all is said and done, though, the acting plaudits for this episode belong most of all to Amanda Abbington and Martin Freeman. Freeman’s Watson is, as always, a multi-layered man with a seemingly-simple facade that overlays a world of emotion and passion. The final scenes, of course, have pulled a great deal of focus from the rest of the episode, but Freeman plays the earlier scenes of the quiet desperation of a new father losing touch with his wife and experiencing the temptation of another woman with piercing vulnerability. He’s an actor who never settles for the comfortable version, and he forcibly compels the audience to feel his internal conflicts. Abbington, in her swan song on the show, plays a Mary whose past has finally caught up with her. We watch her, like a hunted animal, run from the inescapable, and she’s mesmerizing on screen. Even in scenes that, as plot points, I didn’t care for, I found her screen presence enthralling. Her Mary is by turns brittle, sweet, funny, and finally desperate. In the end, she made me care. As Babe Ashley Polasek says in our reaction episode, even though she didn’t particularly enjoy how the episode arrived at it, Mary’s death made her cry. It was just that well-played. The chemistry between Freeman and Abbington as John and Mary wasn’t so much tender as brutal, and when they finally said goodbye, their pain mingled into something almost unbearable to watch in its intensity. I’d also be remiss in not mentioning the wonderful direction of Rachel Talalay, new to Sherlock, but veteran of hits like Doctor Who and The Flash. Her deft hand brought atmosphere, style, and beauty to the episode and made some very complicated sequences work and retain visual coherence. “The Six Thatchers” has a gorgeously operatic quality, and the bold images of the aquarium, the stark simplicity of Mycroft’s office, and the richness of the foreign settings created a feast for the eyes. Unfortunately, alongside these brilliant elements, other aspects of the episode didn’t quite work as I’d hoped. I could come at this from several angles, but since this review is already getting long, I’ll try to keep it concise. If you listen to our upcoming reaction podcast, you’ll hear that we had strong criticism of the plot of “The Six Thatchers” and of the implications of what it means for the future of the series. First, taking the plot alone. It was meta. (I’m not even sure meta is a strong enough word for how self-referential it was). We in the Babes enjoy a bit of meta, and for the most part, we were big fans of “The Abominable Bride,” which was about as meta as you can get–or so we thought. The problem is, at least partially, a context issue. A one-off Christmas episode can take a mind-palace trip that shows us Victorian versions of our beloved characters and dissects their psychology. By placing them back in their original contexts it bought the collateral necessary to get away with it. That is most definitely not the context we find ourselves in with “The Six Thatchers.” We’re back in the “real world” with our modern heroes and their daily jobs and problems. But apart from very brief deductive montages, we didn’t have an episode of Sherlock Holmes being Sherlock Holmes, solving cases, being a detective. We were almost entirely in navel-gazing territory, where the characters’ problems were almost entirely created by themselves. At some point, if Holmes spends most of his time solving problems created by or primarily involving him (the ending of the ep) and his friends (most of the rest of it), there’s a curiously claustrophobic and inward feeling to the action. Even as it goes global, it feels small, smaller than it should. This episode also asked viewers to accept the idea that John Watson, a character whose loyalty to his friends and loved ones has been his primary trait in the series thus far, is carrying on a late-night extramarital flirtation while his new baby cries in the next room. Three-Continents Watson might be flattered by a woman’s attention on a train; the man we know and love, however, would not let it go beyond that. He’s not perfect, but nothing in the series or the source material paints him as anything other than a faithful partner. I understand the plot’s reason for this–the fact that Watson’s anger at Holmes after Mary’s death is projected anger at himself. That’s possibly the biggest problem. It feels like John’s actions served the plot, rather than the other way around. Finally, as enjoyable as it was to watch Mary traveling the world as different characters (and it was great fun), it was all a bit much. Sherlock has always had a heightened quality, but it’s anchored in reality. The international espionage elements of “The Six Thatchers” didn’t feel in any sense anchored in reality, and the previous episode it called to mind, in our opinion, was “The Blind Banker,” which also struggled with feeling a bit ridiculous for similar reasons. (Don’t get me wrong; as with this episode, there are aspects of “The Blind Banker” we greatly enjoy, but along with many fans, we consider it one of the weakest of the series.) This criticism has nothing to do with the stellar performances. In fact, if this is Amanda’s James Bond audition, we heartily support her being cast as the first International Woman of Mystery. In a more general sense, we’re concerned about what this episode says about this show’s trajectory. Sherlock has always been a show about a detective, rather than a detective show; that’s a given. One of the main things that drew us in at the beginning was the side-by-side interplay of what we learn about the man through the mysteries he solves. Memorable moments like Watson yelling about Holmes’s lack of care, Holmes asking whether something is “not good,” and the heart-shattering moment of the Reichenbach Fall were all wonderfully poignant character moments, but those moments were earned by being integral parts of the mysteries the episodes and seasons presented. Once those mysteries fall away, the series becomes nothing but a very heightened show about the relationships between an extremely small group of people. “The Six Thatchers” was phenomenally acted, but in the end, the primary story wasn’t much of a mystery at all. If we take Sherlock Holmes out of his time, that’s fine. If, as in TAB, we put him back in his time and change up the focus of his story, also fine. What concerns us most is this episode seemingly trying to do both–giving us the modern Holmes of most of Sherlock (obviously), but failing to give him back his primary function as a solver of mysteries. Additionally, by placing such a huge rift between Holmes and Watson, while taking Watson somewhat out of character, the show has also endangered the primary relationship of the source material, the core friendship between the detective and his doctor. Holmes alone is not the Holmes we know and love; he’s diminished. To be fully realized as a character, he needs his Boswell (or blogger). Let’s finish up on the maybe question. We don’t know what’s coming in the rest of this series of Sherlock beyond general information, and it’s possible we may end up with a different view of “The Six Thatchers” by the end. The Moriarty question still looms over the show, and one of our criticisms in this episode was that it didn’t link Sherlock’s ongoing obsession with any tangible clues. We may find later, however, that it dropped clues we didn’t grasp. Also, if the resolution of the Holmes-Watson rift is strong enough, we may look back and find that the conflict was worth it, or at least less troubling. More than anything, if the next episodes return to tightly-plotted mystery with clues and deduction, we’ll be very grateful, because while we love the characters of Sherlock dearly, what we love most is learning about them while they do the work of solving mysteries in the world around them. I’ve now seen “The Six Thatchers” three times, and I thoroughly enjoyed each viewing. Even when, in our opinion, Sherlock isn’t quite firing on all cylinders, it’s still very good television with excellent production values. Though not our favorite in terms of story, this season opener will live on in our minds for its beautiful visuals and stunning performances, and we will miss Amanda Abbington’s presence. Criticism aside, she made Mary vibrant and alive and wonderful, and we won’t forget her or what she added to the world of the show. As with my reviews for “Hearse” and “Sign,” this one will contain a spoiler-free section followed by a marked spoiler section. Well, twelve days later, we’re one season further in the progression of Sherlock, finished with a third series that gave us a finale that was at the same time one of the most and least traditional episodes the series has produced. 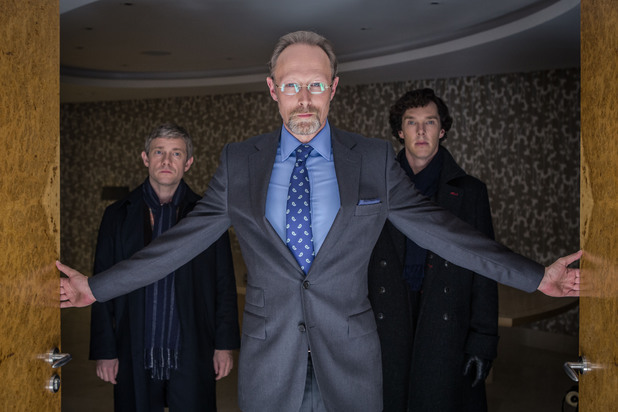 Penned by writer and showrunner Steven Moffat, “His Last Vow” was, in many ways, a close re-telling of “The Adventure of Charles Augustus Milverton” — to a point. Canon devotees will find a huge amount to love about the episode, which gave nods to Doyle both great and small, through plot events and characters. Those who have joined the fandom for the show alone will also find ample examples of what makes Sherlock great as a series. It’s difficult to talk about this episode without spoilers, but suffice to say that Lars Mikkelsen imbues Charles Augustus Magnussen with every hateful fiber of Doyle’s master blackmailer, and in some ways, in my opinion, the connections Moffat wove between the story and characters we already love improved a great story by adding depth and suspense. In terms of direction, “His Last Vow” wasn’t my favorite, but the superb acting and writing were enough to overcome a few confusing moments. Amanda Abbington proved once again that she can go toe-to-toe with two of the best actors in the business, and touching performances by Mark Gatiss, Louise Brealey, and the delightful Timothy Carlton and Wanda Ventham (Benedict Cumberbatch’s real-life parents) rounded out the emotionally harrowing story. “His Last Vow” completes this season’s superb trilogy in a fitting way, bringing to a conclusion the questions it raised, and bringing us, the audience, closer to the characters we’ve come to love, all while letting us tag along with a nail-biting mystery. May Series 4 not be long behind. It was frenetic; it was suspenseful; it was heartbreaking. “His Last Vow” finally gave us the truth about Mary Morstan and showed how far Sherlock Holmes is willing to go to protect his friends. The opening nod to “The Man with the Twisted Lip” and the introduction of (Billy) Wiggins were wonderful treats for canon lovers, and the first half hour trajectory of the episode appeared to be sticking almost completely to the Doyle story–until Magnussen’s would-be shooter pulled off her face mask. I wasn’t surprised to learn that Mary Morstan had a past, and I thought it was fitting that we never found out exactly what it was. Through her story, we learned even more completely what a truly good-hearted person John Watson is. We also learned that Sherlock Holmes has a personal vision of justice–one in which he appraises people’s characters in his own way, forgiving the woman who put a bullet through him and putting his own bullet through someone else. I imagine there will be debate about Sherlock’s final solution to the Magnussen problem. First of all, it’s canonical. Though he doesn’t fire the bullet himself, Holmes stands by and willingly lets Milverton be killed in front of him when he could easily prevent it. Secondly, the question of the killing itself. Both in the canon and in Sherlock, Milverton is the most despicable of criminals, even more so than Moriarty. He may not have personally pulled the trigger, but he is unequivocally responsible for the deaths of hundreds, probably thousands, of people whose lives he’s ruined. He’s as close to pure evil as Doyle comes in the canon. He’s also beyond normal justice. He’s so powerful and so connected that what Holmes allows (in the story) and carries out (in “His Last Vow”) is an act that is in service to queen and country, family, and friends. He saves Mary, but he also saves the world from extraordinary evil. Does a moral question remain? Perhaps, but Doyle found Milverton worthy of death, and Sherlock chose the same course for Magnussen for the same reasons. As I stated above, the directing of “Vow” bothered me a little bit. I missed (previous director) Paul McGuigan’s extraordinarily deft touch and found myself lost for a few seconds more than once, trying to understand the passage of time and order of events. This didn’t keep me from enjoying the episode, but I couldn’t help but think another director’s pacing and style might have done it slightly better justice. Ultimately, thinking back to Series 1, Episode 1, “A Study in Pink,” it’s as if we’ve made an extraordinarily long and rewarding circle. “Vow” ended with Sherlock Holmes doing for John Watson what Watson did for him at the end of the beginning–eliminating his greatest threat. It left us with a Holmes who is needed in London once again to confront a familiar threat, with his best friend by his side and a brother whose love for him is made no less potent by the complications of its expression. Once again, I keep thinking of Inspector Lestrade and his elegantly simple assessment of Sherlock Holmes as a great man who might some day be good. 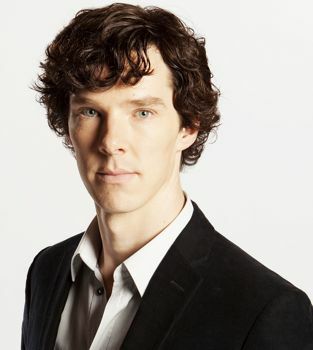 Series 3 of Sherlock has completed the transformation, and I look forward to what’s to come. 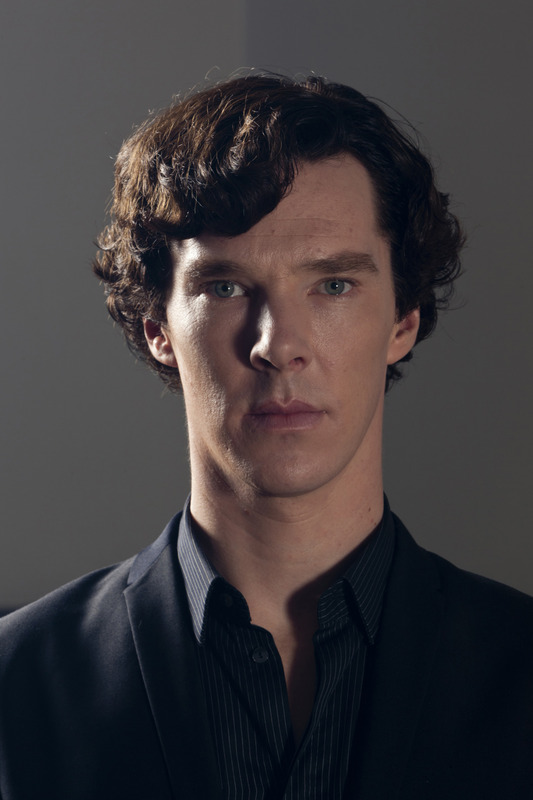 This post will contain spoilers for the first two episodes of Sherlock Series 3. Let’s get one thing out of the way at the outset, namely, what this post is not intended to do: This post is not intended to convince anyone to like “The Sign of Three,” Sherlock the show, or anything else. Liking is a matter of taste, and no one should be bullied because their taste is different from someone else’s. That aside, what is the purpose of this? Well, it’s pretty obvious by now that this series of Sherlock has been polarizing from the get-go, particularly “The Sign of Three,” which aired January 5th and has been the source of debate ever since. Some people loved it; some people hated it–I’ve seen very few opinions in between. The specific criticism I’m addressing in this post is the idea that the level of emotion, sentiment, and overall warm-fuzzies in “The Sign of Three” was somehow anti-traditional, in opposition to, or different from the Sherlock Holmes stories by Sir Arthur Conan Doyle. I’ve now written two posts outlining canonical references in “The Empty Hearse” and “The Sign of Three.” What I’m doing now is mounting a more in-depth canonical defense of “Sign,” using specific ideas and quotes originated by Sir Arthur Conan Doyle. I’m going to do this three ways: Holmes’s character arc, story themes, and direct quotes. By no means is this intended to be an exhaustive survey of the whole canon; we could be here all day. I’m simply providing a jumping-off point to remind us all how Sir Arthur, surely the ultimate authority on the character of Sherlock Holmes, wrote, and what he actually had his character do and say and how that relates to “The Sign of Three.” After all, if we’re going to throw around comparisons to the canon, we want to know what it actually says, right? Let’s get into it. Sir Arthur Conan Doyle was in his 20s when A Study in Scarlet, the introductory Sherlock Holmes story, was first published. He was nearly 70 when The Case-Book of Sherlock Holmes was published. In the intervening years between the two, he published over forty stories about Holmes, and those stories, contrary to cultural perceptions of Sherlock Holmes, do not paint a picture of a static character who remains entirely the same. Moreover, in the canon of BBC Sherlock, all of series three is taking place post-hiatus, when Sherlock is back from the dead. Most scholars of Doyle would, I believe, agree that there are some general differences in the canonical Holmes stories pre and post-hiatus. One of the most notable, in my opinion, is a believable softening of Holmes’s character as he ages. In his first return story, The Empty House, he says, “So it was, my dear Watson that at two o’clock to-day I found myself in my old armchair in my own old room, and only wishing that I could have seen my old friend Watson in the other chair which he has so often adorned.” This is hardly a man who shies away from stating his obvious affection for his best friend. As the stories continue, so continues the increasing warmth. Famously, in “The Three Garridebs,” Holmes says to a criminal, “By the Lord, it is as well for you. If you had killed Watson, you would not have got out of this room alive. Now, sir, what have you to say for yourself?” The idea of Holmes making his first and last vow to protect his friend and family in “The Sign of Three” mirrors this quote closely. In the interest of brevity, I’ll stop here, but an examination of Holmes’s character from the beginning to the end of the canon reveals subtle changes. A young man becomes an old one, and a mind that begins by valuing everything else above friendship is ultimately unafraid to acknowledge his warm attachment. For maximum evidence of the character’s progress, pick a story from The Adventures of Sherlock Holmes and a story from The Case-Book of Sherlock Holmes and read them in immediate succession. Now that we’ve discussed the changes in canonical character of Sherlock Holmes, let’s move on to the pride of place that sentiment has in many stories from the canon. This is the section that threatens to get away from me with respect to length, because the idea that the level of sentiment inherent in the execution of the wedding theme in “The Sign of Three” is somehow in opposition to the canon of Sherlock Holmes is so erroneous that almost every story disproves it somehow. Nevertheless, I’ll try to hit some of the high points, while strongly encouraging those in doubt to go back to canon for themselves. Suddenly, Sherlock’s gentle assertion that Mary is worthy of John in “The Sign of Three” barely seems to register on the sentimentality scale, and this is but one quote from a novel filled with such passages. Let’s continue. 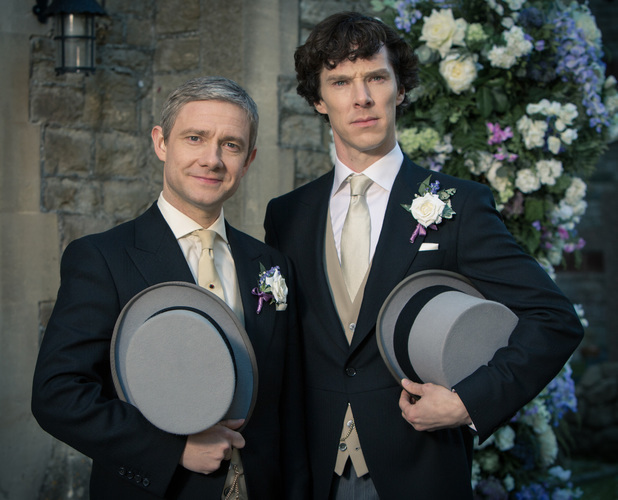 Several Holmes stories contain weddings and wedding themes. Off the top of my head, I can think of “The Noble Bachelor,” “A Case of Identity,” and “A Scandal in Bohemia,” in which Holmes ends up being part of the ceremony. “’And now to-night you at last know all, and I ask you what is to become of us, my child and me?’ She clasped her hands and waited for an answer. Such emotional scenes are never far from Doyle’s pen, and several stories contain them. Additionally, “The Dying Detective” has a plot that almost entirely centers around Watson’s ever-increasing emotional desperation over the fact that he thinks Holmes is dying. It’s hardly a cracking caper; it consists of a middle-aged man trying to save his friend while experiencing utmost distress. Yet another aspect of the canon, seen in The Sign of Four in particular, is the Baker Street Irregulars, the network of children Holmes employs to prowl the London streets looking for clues. Holmes fondly calls them, “the unofficial force,” and Doyle pens them with equal parts humor and sentiment. Those who found either the sentiment of “The Sign of Three” or the humor found in sections like Holmes’s encounter with the little boy named Archie anti-traditional would do well to re-read the chapter Doyle named for the Irregulars. “Then my friend’s wiry arms were round me, and he was leading me to a chair. Many, many more such quotes pepper the canon, and I cannot recommend discovering them for yourself highly enough. The Doyle canon spans years of a writer’s life and a character’s soul. It is filled with the entire range of human existence. Yes, there is murder and mayhem, but there is also a bevy of weddings and romances and embraces. It is Doyle’s Watson himself who goes from telling us in “A Scandal in Bohemia” that love and emotion are abhorrent to the mind of Sherlock Holmes to telling us that the detective loves deeply and is in possession of “a great heart as well as of a great brain.” Similarly, the creators of BBC Sherlock introduced us to a man who believed the only reason he needed a friend is because genius must have an audience and proceeded to develop that man, through trial and experience, into someone who understands the value of companionship and love, to the point of recommending it to his own brother. Doyle was a writer who understood that reason and emotion are both necessary parts of a full life, and he peppered the canon with both, through his characters, his themes, and his plots. In its first two series, Sherlock showed us a great brain. In “The Sign of Three,” it gave us an equally great heart. I believe Sir Arthur Conan Doyle would approve. Spoilers ahead—read at your own risk! “The Sign of Three” is one of the most canon-heavy episodes of Sherlock to date, and there are many more references than I’m listing here. This is just a short exploration of some of my favorites. “The Sign of Three” had numerous obvious references to The Sign of Four, the canonical novel by Sir Arthur Conan Doyle in which Watson and Holmes meet Mary Morstan, and Watson falls in love with her. One of my favorites, which went through the episode, was the strong indication of Mary’s intelligence. During the wedding planning scenes, Mary remarks that she can tell when Holmes is fibbing, even when Watson can’t. She also has several conversations with Sherlock in which she relates to him on a level that shows her awareness of his positive qualities and his awareness of hers. In The Sign of Four, upon being told that Watson intends to marry Mary Morstan, Holmes remarks, “I think she is one of the most charming young ladies I ever met, and might have been most useful in such work as we have been doing. She had a decided genius that way: witness the way in which she preserved that Agra plan from all the other papers of her father.” During this same conversation, Holmes says that he cannot congratulate Watson on marrying Mary and taking away the potential for her to become a detective. In “The Sign of Three,” Holmes also speaks about not (initially) being able to congratulate Watson, but ultimately does so, basing his congratulations on the fact that the Mary found in Sherlock is worthy, just as Doyle’s version was. One of the humorous through-lines in Sherlock is Mycroft Holmes’s ever-present battle with his waistline. In “The Sign of Three,” we see him exercising, and Sherlock intimates that this is something he does regularly. To update Mycroft for the modern, fitness-obsessed world (and connect Mark Gatiss with one of his finest performances ever), the writers of Sherlock have let him lose the corpulence but continue to engage in a very human struggle with his weight. Of course, Holmes’s actions in “The Sign of Three” belie his claims of being without love, just as his actions throughout the canon, and particularly post-Great Hiatus, give lie to Watson’s assertions about him. “The Sign of Three” features Holmes enjoying an awkwardly gentle flirtation with Mary’s Maid of Honor, something it would have been difficult to imagine him doing at the beginning of the series, but which jives nicely with his character development in Series 3. Similarly, in Doyle’s “The Lion’s Mane,” one of the few stories narrated by Holmes himself, he describes a woman named Maud Bellamy, “She listened to a short account from my companion, with a composed concentration which showed me that she possessed strong character as well as great beauty. Maud Bellamy will always remain in my memory as a most complete and remarkable woman.” It would be difficult to imagine the protagonist of A Study in Scarlet saying this, but Doyle did not make Holmes a static character. Like a real person, the canonical detective grows and changes, and part of this change includes a softening toward people in general and women in particular. The writers of Sherlock have chosen to show this development in a similar way. In Doyle’s The Sign of Four, Major Sholto is a friend and army colleague of Mary Morstan’s father. 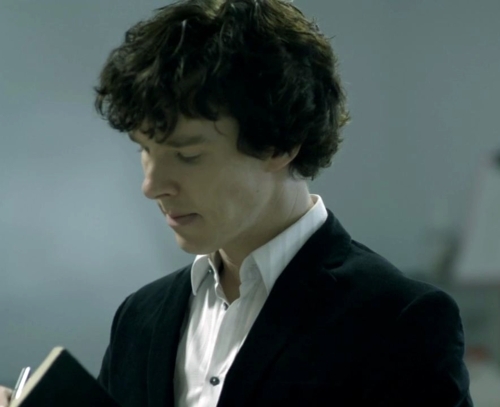 The character and circumstances are very different from those in “The Sign of Three,” which provides an entertaining puzzle for canon lovers watching Sherlock who can’t help wondering whether or not his actions will mirror those of the original Sholto, much like in “The Hounds of Baskerville,” which similarly used canonical characters in new ways. One of the most humorous sequences in “The Sign of Three” concerns Sherlock coaxing and bonding with a young boy named Archie, who ends up entirely taken with the detective and his gruesome occupation. Giving Holmes the ability to connect well with children is entirely Doylean. The Sign of Four contains a chapter named for the Baker Street Irregulars, the group of children Holmes employs, and generously compensates, for prowling the streets to gain information for him. It’s obvious from Watson’s brief description of Holmes’s relationship with the children that they adore him and that he, in turn, is very fond of them. Sherlock has largely used Holmes’s homeless network as a stand-in for the Irregulars, but it’s nice to see a reference to the detective’s canonical ability to enchant the younger generation. 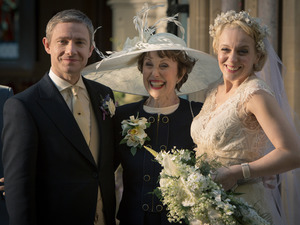 Interestingly, “The Sign of Three” also features Sherlock promising Archie that he will ask a grownup about something—indicating that he thinks of himself as more of a child than an adult, echoed in his final words to Mary and John at the end of the episode. Mary and John receive a wedding telegram from someone with the initials C.A.M., which is the set of initials that belong to the antagonist of Doyle’s “Adventure of Charles Augustus Milverton.” What exactly this means for Sherlock’s characters we have yet to discover.